Well, it’s anything but true. According to the U.S. Bureau of Labor Statistics, the demand for skilled paralegals and legal assistants is projected to rise by 8% in the next five years. And those employed in top law firms can be sure to make a good chunk of change. Looking for a paralegal job? Good for you! But so are thousands of other people. The competition is fierce and if you want to land your dream job, you’re going to need the best paralegal resume out there. And you are going to have one. A paralegal resume example better than 9 out of 10 other resumes. How to write a paralegal resume that will land you more interviews. Tips and examples of how to put skills and achievements on a paralegal resume. How to describe your experience on a resume for a paralegal to get any job you want. Here's a sample resume for a paralegal made using our resume builder. Paralegal Resume Examples - See more templates and create your resume here. What’s the Best Format for a Paralegal Resume? Did you know that corporate jobs usually attract around 250 resumes? So how many of those applicants will get invited to an interview? About 5. That’s 1 in 50. You want to be that 1, don’t you? Then you need a professional paralegal resume that stands out. And it’s essential that you choose the right resume format. In the worst case, if the formatting is off and the hiring manager can’t find what they’re looking for, you can kiss your resume goodbye. 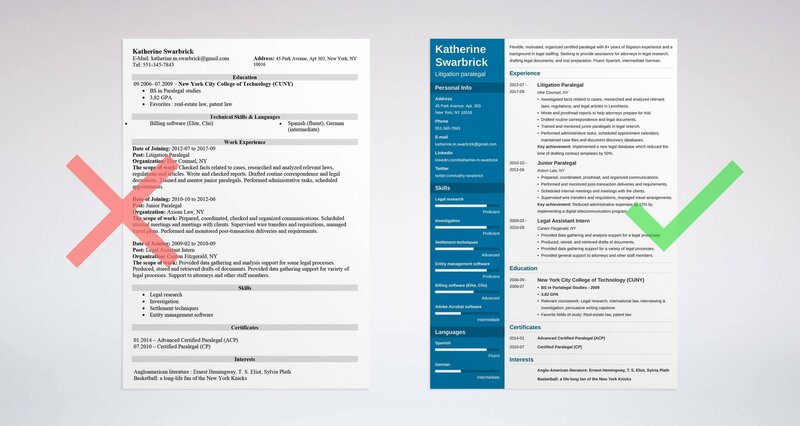 On the other hand, the right resume format and layout will let you highlight the most important information. How do you choose it? In general, the reverse-chronological resume format is the gold standard of the recruitment process. First of all, because the recruiters are familiar with it. They will process your resume in a flash. Secondly, paralegal jobs attract oodles of candidates — too many for a human to handle. That’s where Applicant Tracking System (ATS) software comes in. If you choose the reverse-chronological resume format, the ATS bots will easily identify all the sections of your resume and extract all the information they need. Are you an experienced senior paralegal? The reverse-chronological format will show the peak of your career first, and let you work back through your job history to the early years. But what if you’re targeting a career change? Then, you might want to consider using the combination resume format. 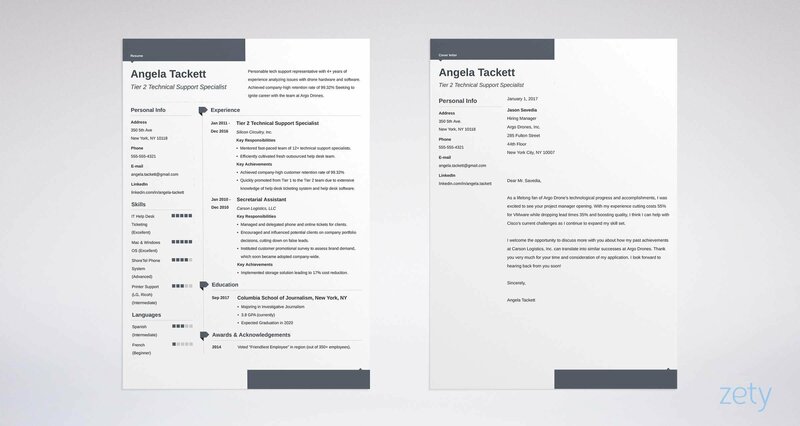 The combination resume format allows you to place more focus on your skills. It helps you link specific skills to your job history rather than just list your responsibilities. Pro Tip: Do your best to keep your paralegal resume one-page. Paralegal employers value these resumes that are brief and targeted. How to Write a Paralegal Resume Summary or Resume Objective? Any idea how long it took you to read this iconic tongue twister? Exactly as long as the average recruiter spends scanning your resume for a paralegal position. Most recruiters expect very specific information and they’re going to look for it in the top third of your resume. If it’s not there, you can be sure that your resume will end up being chucked through the window (alright, maybe in the bin). You can use those 6 seconds to your advantage. Start your paralegal resume with a resume summary or a resume objective. A brief, sharp paragraph that will explain why you’re just the paralegal or legal assistant the hiring manager is looking for. Have multiple years of paralegal or legal assistant experience. Are not making a career change. Those who are looking for a change in their professional career. Let’s have a look at some paralegal resume summary and objective samples. Flexible, motivated, organized certified paralegal with 8+ years of litigation paralegal experience and a background in health administration and personal injury law. Seeking to provide professional assistance in legal research, drafting legal documents, customer service, and trial preparation. Assisted GlaxoSmithKline’s Compliance and Legal Affairs teams in implementing a new complaint handling system. Fluent Spanish, intermediate German. Experienced paralegal, broad legal knowledge, have worked on contracts, civil lawsuits, and other legal needs. Great in teamwork, communication, and multitasking. See the difference? The first candidate mentioned his specific assets and boasted a verifiable achievement. The second candidate just threw in a bunch of general law-related phrases. Yeah, so are 300+ other applicants. Neeext pleeaase! Pro Tip: Employers want to know that you’re a perfect fit for their team. You need to tailor your resume to the job opening: identify the keywords in the job description and make sure to refer to them in your resume. Wow, right? 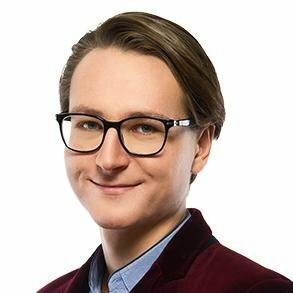 This candidate might not have broad paralegal experience, but he shows his motivation and focuses on what he can offer his employer. I am a recent paralegal program graduate. I would like to work for ACLU to further develop my paralegal knowledge and gain new skills in order to become a notary in the future. When writing a paralegal resume objective, focus on the employer’s gain, not potential benefits for you. How to Describe Your Paralegal Experience? What if recruiters could only see one section of your resume? This section is the meat and potatoes of any professional paralegal resume. And you want yours to be sweet potato fries and Black Angus beef. You’re wondering how to get it right? Start with your most recent job. Then work your way back in time and list all your previous positions. Underneath each job, add up to six bullet points summarizing your duties and achievements. Sounds pretty easy so far? Remember when we mentioned tailoring? This is where it comes in! Read the job description carefully. And if you see tasks that you’ve done previously in your career - let the recruiters know! 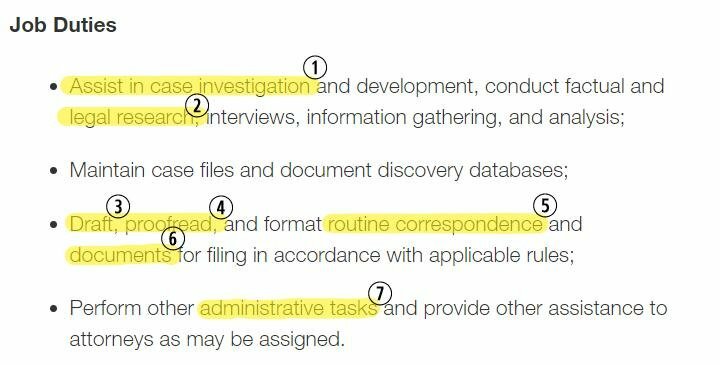 Instead of just listing all your responsibilities, you need to tailor the paralegal resume duties to each job description. Read the example below to see how it’s done. And here’s a litigation paralegal resume work experience description that would be a perfect match for the job offer. Key achievement: Reduced administrative(7) expenses by 12% by implementing a telecommunication program. The job description says the candidate will have to assist in case investigation and conduct legal research. Our job seeker carried out these tasks in his previous job so that’s what he highlighted in his resume. The same goes with drafting, proofreading, and formatting legal documents. “Client service”?! What does that even mean? Not only all paralegals do it. Virtually every other professional does it! Don’t go for generic phrases. It’s never a good idea. It’s also best to mention your measurable achievements in your resume. See how it was done in the right example. The candidate used the PAR (Problem Action Result) formula. Problem: The administrative costs were too high. Action: Implemented a telecommunication program. Result: The administrative expenses were cut down by 12%. But what if you have to produce your paralegal resume with no experience to list? You’ve just graduated from a paralegal course. You have the Westlaw ProDoc certificate. You’ve put in a great deal of hard work to learn the profession. The universe owes you a job. ...But you haven’t worked in the industry yet. Never mind. You should still add the experience section on your entry-level paralegal resume. You might not have paralegal experience - no matter. But you do have other work experience relevant to the job. Prepared, coordinated, proofread, and organized(2) communications(3) and other documents for transaction. Scheduled internal meetings(4) and meetings with the clients. Supervised wire transfers and requisitions(5), managed travel arrangements and expense reports(6). Here, the job seeker listed these responsibilities from her former job that are relevant to the real-estate paralegal duties from the job description. Even if they were not her primary duties, by listing them, she shows that she has the appropriate skills to be a successful real-estate paralegal. Remember that using keywords is not about stuffing the resume with whatever is expected of you. You have to highlight those skills that you do possess. Is the education section of a professional paralegal or legal assistant resume the easiest one to write? Does this mean that it’s the least important one? Most paralegal jobs accept candidates with different levels of education. Do you have a BA in paralegal studies? Another major and an additional online paralegal certificate? Associate’s degree? There are multiple paths to becoming a successful paralegal. What you need to do is describe the one you chose to follow. And this guide is here to show you how. Start with your highest degree. Then add all your other degrees in reverse-chronological order. If you’re an experienced paralegal professional, it’s best if you put your education section after your work experience. Pro Tip: Mentioning your GPA is optional. The usual rule is: add it only if you graduated within the last three years and if it’s higher than 3.0. In fact, if you have any experience in the paralegal field, don’t add your GPA unless it’s exceptionally high. Simple as that. But not always. Keep in mind that a lot of paralegal jobs require specific knowledge. In your education section, you have to refer to the job description. You can do it, for instance, by listing your most relevant coursework. Feel like going a step further? Add your favorite classes, your main field of interest, describe your extracurricular activities or student projects in which you participated. Convince the recruiters that you want to land the job at their company – not just any paralegal job. But remember: it’s going to work only if you use the keywords from the job description. For example, if you’re writing a patent paralegal resume, you’ll want to emphasize your expertise in intellectual property: trademarks, patents, copyrights, and trade secrets. You’re a recent graduate writing a paralegal intern resume. You’re a professional and you’ve recently supplemented your legal education with a paralegal specialist program. In these cases, you can also consider putting your education before your work experience. The job seeker might not have extensive paralegal experience. Nonetheless, the detailed education section serves to illustrate her sense of purpose in starting out on a family law paralegal career. She shows that she’ll handle the job well even if she hasn’t done it before. This is crucial if she’s writing a paralegal internship resume, too! What do Abraham Lincoln and Ellen Degeneres have in common? Charisma? Superior interpersonal skills? Compassion? Yeah, fair enough. But there’s another one: they both worked as paralegals. Being president is a piece of cake once you’ve worked as a paralegal. The recruiters too are well aware that if you’re a great paralegal, you must possess a remarkable set of skills. And you do have those skills! You just have to know how to list them in your paralegal or legal assistant resume. Don’t fret, read on and you’ll learn how to do it in a jiff. Start with creating a spreadsheet in which you list all your relevant paralegal skills. Write down everything you’re good at. (Oh, come on! We didn’t mean “eyebrow dancing” or “walking like a crab”). But, seriously. Everything that makes you a great professional. And don’t forget about your “soft” skills. According to the National Association of Legal Assistants (NALA), paralegal employers see soft and hard skills as equally important. Now, obviously, you cannot list them all in the skills section of your paralegal resume. It would be too long, unspecific, and, let’s face it, hardly believable. First, make sure that you have linked your key paralegal skills with your professional achievements in the experience section. Then, carefully read the job description. Look for skills-related keywords. Once you’ve highlighted them, put your matching skills on your resume. Noticed how many of these requirements are “soft” skills? Resourceful, organized, with great attention to detail. Strong teamwork and interpersonal skills (assisting senior attorneys, negotiating with the clients). Proficient with entity management software (hCue, Blueprint OneWorld). Experience with managing board portals (Azeus Convene, FlexxBoard). The candidate showed that she meets all the skills-related requirements and provided examples to prove her proficiency. ProTip: It’s a great idea to research various paralegal job descriptions not only the one you’re applying for. You’ll get the picture of what’s usually valued by law firms. Meet Mike and Cathy. They don’t know each other, but there is a particular connection between them. Mike and Cathy have applied for the same corporate paralegal job. And they’re both dead good. They’re experienced, well-educated, they have excellent references. Their resumes. This is what sets Mike and Cathy apart. Mike listed his previous jobs, described his education in full detail, boasted his skills. Cathy did all that too. Then she decided to show off her Paralegal Certificates in a separate section. And you know what? Cathy just got an invitation for her job interview. To become a paralegal, you need to complete the necessary level of education. Certification for paralegals is voluntary, so a lot of candidates assume they don’t have to include their certificates on a paralegal resume. National surveys consistently show that corporate law firm recruiters use certifications such as Certified Paralegals (CP) and Certified Legal Assistants (CLA) to determine candidate’s actual skills. If you have taken and passed any certification exams, you have to add a credentials section to your resume. This way you’ll show the recruiters that they’re not buying a pig in a poke. You might also choose to list your certifications in the education section. If so, you should still consider adding another section to your resume. The recruiters want to know that you have kept self-improving after you got your paralegal degree. ProTip: It’s okay to repeat some of the information from the work experience section. It shows that there are some achievements you want to highlight. If you’re a recent graduate seeking an entry-level paralegal job, you might add an “Additional student experience” section where you can describe your extracurricular activities and link them to your academic interests. Sound like the worst career advice one can get? Yeah, it probably is. “You don’t need a cover letter” comes in a close second. You might have the best paralegal resume. Still - 45 out of 100 recruiters won’t even bother to look at it if you don’t write a paralegal cover letter. And if you wouldn’t play online poker to make a living then don’t play job-seeking roulette either. If you are in the paralegal business, you surely have great written communication skills. You must also be extremely attentive to detail. What better way to showcase those qualities than by writing a neat, compelling, professional paralegal cover letter? Cover letters can do what even the best resumes can’t. Feel like there is some role or achievement from your resume that needs some explaining? Just remember that cover letters for paralegals serve to supplement your resume not to paraphrase it. ProTip: As a paralegal, you have to demonstrate superb research skills. Make sure to address your cover letter to the person who will read it. It requires some basic research, and you really don’t want to mess it up! You want your paralegal resume to bring this response from the hiring manager. And it will. Just remember about the key strategies we covered. Make a list of all your abilities, achievements, and previous responsibilities and match the skills with the keywords from the job description. Put a paralegal resume objective or summary just below your contact information. Don’t undersell your abilities and knowledge. Highlight your strong suit and put the focus on your wins. Show off your certifications and boast your software skills. Do you want to learn more about writing the perfect resume for a paralegal job? Not sure how to list your extra achievements? Give us a shout in the comments, and we’ll answer your questions! Complete guide to writing a customer service representative resume. Write a customer service resume that gets jobs. Best CSR resume tips and 20+ examples.